Queenstown - The Perfect Family Destination. If you’re hoping for a thrilling family getaway that offers a flawless blend of adventure and relaxation, then Queenstown is just what you’re looking for. Renowned for its naturally spectacular landscapes and electrifying activities, Queenstown offers a little something for everyone. No matter how old you are! The remarkable natural backdrop is not only visually striking, but you can also enjoy it up close and personal with a multitude of nature-oriented activities to keep everyone in your family enthralled. From hiking and skiing to jet boats and horseback rides, Queenstown’s exhilarating lifestyle is an exciting allure for most tourists. That’s not all, soak in the extraordinary scenery from the air with a helicopter ride over the labyrinth of mountains or bite into a slice of daredevilry with a paragliding or parasailing adventure. If you’re the type of person that wants pure relaxation, then the Onsen hot pools are right up your alley. There’s a whole bunch of tour operators offering special discounts and family rates − making the whole family vacation far more affordable. If you want to experience Queenstown at its supreme best, look out for these tours − there’s no better place in the world to unleash your adventurous self. Parasailing - Paraflights NZ − Parasailing is at its gleeful best when you’re soaring 200 metres over the pristine waters of Lake Wakatipu. Straddled with a cable to a powerboat below, you can choose a tandem sail with your partner; you can go alone or hop on a triple flight with the family. Don’t forget to get your camera for this unforgettable parasailing trip to capture incredible views of the Remarkables and this exceptional city. The ride lasts for a few minutes, but the experience will remain etched in your memory forever. Helicopter Flight - The Remarkables − The dramatic scenery of Queenstown is offset magnificently against the stunning Remarkables and the soothing waters of Lake Wakapitu. While impressive from the ground, nothing compares to an airborne view of this extraordinary landscape. Enjoy the supremacy of the Remarkables, as you land 1538 metres above land dramatically. During winters, you’ll caress immaculately white snow as you land. The Helicopter Line operates their flights from Queenstown Airport. The tour offers return transfers from hotels across central Queenstown. Shotover Jet Boat Queenstown − This jet boat sprouts down the Shotover River so fast, you’ll try your best to stay calm, but the exhilaration will engulf you like never before. From the powerful engine roar to the unbelievable acceleration, feel fantastic as your adrenaline escalates. Down the Shotover River and the impressive Shotover Canyon, the Shotover Jet initiates its signature move − the electrifying 360-degree spin that will have you screaming in both fear and delight. Absorb the exceptional sights and surrounding beauty as you cruise across the river. The Shotover Jet Boat is reputed for being the most thrilling jet boat ride ever. Don’t you miss it! Hot Pools - Onsen − There comes a time when rest and relaxation beckons. Immerse yourself in the striking Queenstown scenery as you experience the tranquillity of Onsen Hot Pools. Revel in the warmth and quietude of the private pools and feel the strain in your body disappear. Your body will thank you for this exonerating experience. Every bathing room offers to-die-for views of the iconic Queenstown mountain ranges. Choose a beautiful day experience or cuddle by the starlight for a majestic hot pool experience. 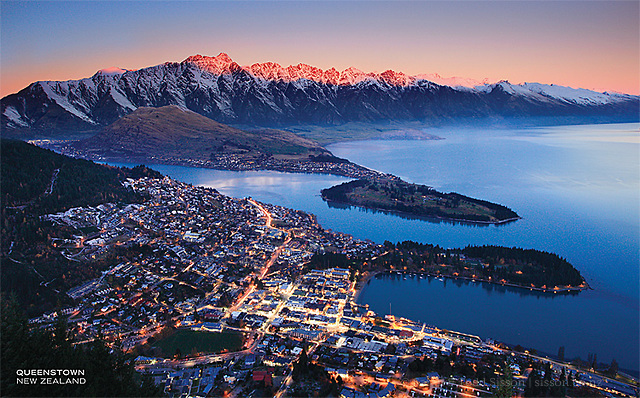 Queenstown is an incomparable holiday destination with so much excitement and natural beauty. You’ll rise to superhero status when you give your family the Queenstown experience of a lifetime!